Kermans Flooring in Indianapolis has been helping homeowners find the perfect hardwood flooring for decades. We've seen hardwood flooring trends come and go. Should you follow trends when it comes to flooring? Trends can be a great source of inspiration. Trends can also be a good guide if you are looking to update a room for yourself or in preparation for selling a house. Dark hardwoods: Regardless of the type of hardwood floors, many customers are opting for dark - in some cases very dark - stain colors. Popular stains are ebony, walnut and even true black. These stains look different on different types of wood so be sure to get a sample of your selection to make sure it's the look you're seeking. Gray floors: Gray has been a popular choice in flooring for a few years and gray wood floors are no exception. Gray floors can be either rustic or sophisticated depending on the finishing style and your personal decor. Either way, they make a beautiful, fashionable floor choice. Natural floors: While dark or gray hardwood floors are the most popular choice at our Indianapolis hardwood store we are also hearing customers begin to ask for a completely natural floor. 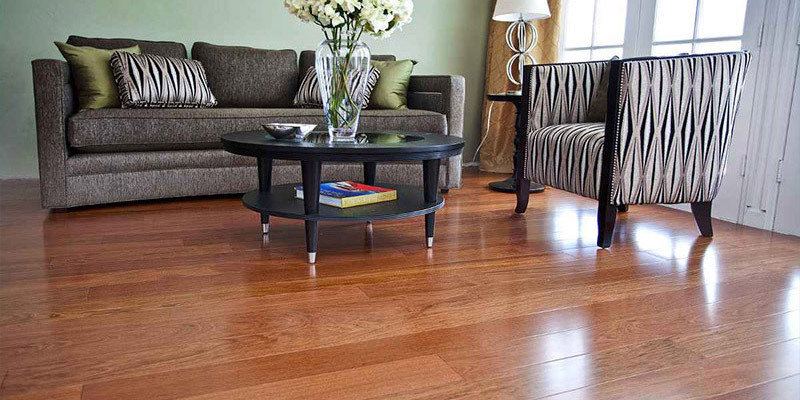 A natural wood floor with no stain brings a very casual, airy feel to a room. Each of these trends is available in a variety of wood types and grain patterns. Learn more about hardwood floors. Back to our original question: Should you follow trends when it comes to flooring? Our advice: when it comes down to choosing a floor, follow your own preferences over any trends. After all, when it comes to hardwood floors you'll be living with the choice for years to come.